· Fernando Ponz, Deputy Head of Division for Central America, Mexico and the Caribbean, EEAS. • Katja Afheldt, Head of Division for Central America, Mexico and the Caribbean, of the EEAS. H.E. Ms Maria Dolores Agüero Lara, Minister of Foreign Affairs and International Cooperation of the Republic of Honduras. - Mr Aldo Dell'Ariccia, Head of Division for Central America, Mexico and the Caribbean, of the EEAS. 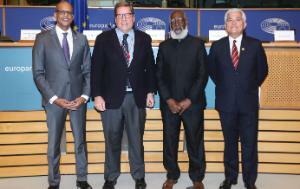 the Delegation to the Euro-Latin American Parliamentary Assembly (DLAT). Co-Chair Sofia Sakorafa (DCAM) reminded MEPs about the Delegation visit to Panama from 30 March to 1 April 2016. H.E. Isabel de Saint Malo de Alvarado, Vice-President and Minister of Foreign Affairs of the Republic of Panama. Co-Chair Sofia Sakorafa (DCAM) said she was very pleased by the visit of Mr Hugo Martinez to the European Parliament to present the National Security Plan of El Salvador. Antonio Morales, Deputy Secretary for Governance of the Presidency of the Republic of El Salvador. Accession of Costa Rica to the OECD. The Chair announced that the approval by the Legislative Assembly of Costa Rica of PARLACEN's proposal to modify provisions for the composition of the Central American delegation to the JPC is still pending. - Bettina Jacobsen, the Member of the European Court of Auditors responsible for the report. H.E. Mr István Alfaro, Ambassador of Costa Rica to the EU.